Abstract. The Chinese C-Coupler (Community Coupler) family aims primarily to develop coupled models for weather forecasting and climate simulation and prediction. It is targeted to serve various coupled models with flexibility, user-friendliness, and extensive coupling functions. C-Coupler2, the latest version, includes a series of new features in addition to those of C-Coupler1 – including a common, flexible, and user-friendly coupling configuration interface that combines a set of application programming interfaces and a set of XML-formatted configuration files; the capability of coupling within one executable or the same subset of MPI (message passing interface) processes; flexible and automatic coupling procedure generation for any subset of component models; dynamic 3-D coupling that enables convenient coupling of fields on 3-D grids with time-evolving vertical coordinate values; non-blocking data transfer; facilitation for model nesting; facilitation for increment coupling; adaptive restart capability; and finally a debugging capability. 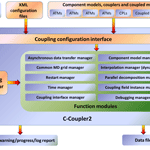 C-Coupler2 is ready for use to develop various coupled or nested models. It has passed a number of test cases involving model coupling and nesting, and with various MPI process layouts between component models, and has already been used in several real coupled models. How to cite: Liu, L., Zhang, C., Li, R., Wang, B., and Yang, G.: C-Coupler2: a flexible and user-friendly community coupler for model coupling and nesting, Geosci. Model Dev., 11, 3557-3586, https://doi.org/10.5194/gmd-11-3557-2018, 2018.